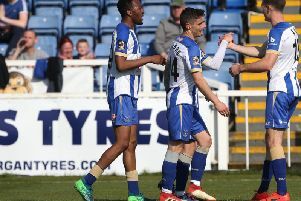 Hartlepool United are ready for a “test” when they come up against the Arsene Wenger of the Football League tomorrow. Pools face an Exeter City side managed by Grecians legend, Paul Tisdale. The 43-year-old has been in the St James’s Park hotseat for a decade – only Gunners boss Wenger has been in charge of an English club for longer. Hignett joked that he would be upset if he ws still in charge of Pools after 10 years, but says he has great admiration for Tisdale and how the Grecians play. “Paul, year on year, has done really well,” said Hignett. “He’s a nice fella who gets his teams playing the right way. “I know what to expect, and it will be a real test, but I know how we will play against them and we’ve done work on that. “Exeter were a little unlucky to lose 2-0 at Blackpool last Saturday – they hit the woodwork twice and the second home goal was a deflection. But in midweek, Tisdale masterminded a EFL Cup shock when Championship side Brentford were beaten 1-0. Pools have a good record at St James’s Park, winning there on two of their last three visits. “You have grounds like this where you do tend to well, sometimes with no reason, and I hope that continues tomorrow,” said Hignett. “It will be a tough game with a bit of travelling involved.